An easy run through Falmer, beyond to Loose Bottom and back through Stanmer Park, fine and hot. The most beautiful part of marathon day, oddly, was the early morning drive from Seaford to Haywards Heath in the morning: clear roads, bright sunshine on the downs and the Ouse valley. But travel from Haywards Heath onwards was definitely suboptimal. The very reason that I had to go to Haywards Heath was that the first train from Seaford on a Sunday day morning didn't leave till just before 8 and wouldn't have got me to Greenwich until well after the start. The obvious thing to do, drive to Brighton and catch a train, was impossible as they had chosen marathon weekend for engineering and there was a bus service between Brighton and Haywards Heath. On top of this, the railway gods saw fit to cancel the train I had planned to catch; fortunately I arrived at Haywards Heath in time for an earlier one. This just missed its connection at East Croydon. Then I narrowly missed another at London Bridge and arrived at Greenwich with only 30 minutes to spare. This barely gave me time to change on a bench in Greenwich Park, deposit my kit bag on the baggage lorry and have a pee. Consequently I missed my place in the pen where I should have been at the red start, and ended up in the pen with the fancy dress runners. In fact I was so far behind that during the race, as I made my way through the field, I overtook the Runners World pace group designed to get you round running and walking. The start was congested and it took around twenty minutes to reach the start line. The first ten miles were easy, though crowded. It seemed to take a very long time to reach the Cutty Sark and I failed to see friends who were watching at Greenwich. So far I felt fine, my stomach was perhaps a little odd, but I put that down to nerves. But at around the tenth mile I began to feel pain in my right thigh, and as I ran on it got worse. The other side of Tower Bridge I stopped to stretch, and again in Docklands around mile 15. It wasn't going to go away so there was nothing for it but to carry on. But my splits show that it slowed me down considerably. I drank more water than I think I have ever drunk in my life, and avoided sports drinks until mile 20 or so, when I reasoned that even if they affected me badly, I needed them and could cope with any ill effects. Towards the end I managed to find some acceleration and ran the last two miles at quite a decent pace. Lessons for next time: get there earlier, run faster. Where next for this blog? My next short term target is the Seaford half marathon in June; after that the Jog Shop Jog in August and beyond that I shall certainly do more marathons, possibly abroad, though I would like to go back to the Beachy Head marathon to slay the demons that affected me last time. I find it useful to record my running and in the belief that there may be a few odd souls out there who may find it interesting, I'll keep this blog going. But the title needs to be changed. At lunchtime today (when it was grey and wet: not sunny and nice as it is now) I ran alongside the A27 nearly as far as the Kingston roundabout. It's not very pretty but straight and flat, which is what I needed for 4 X 800 metre runs with 400 metre jogs in between. A rest day today, so I went swimming for the first time for a while, restricting myself to 1 km. 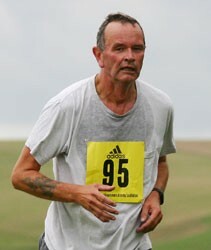 It's an alarming thought that I have less than six weeks till the Seaford Half Marathon. I must work out my training. My first post-marathon run today, up on to the Downs. It was quite easy, though my legs felt a little odd. Today was the day. I started well, hitting 9 minute miles as planned for the first ten miles, but then cramp or something similar hit in right leg. So final time according to own watch was something like 4:32. Official time to follow. Thank you to everybody who supported me and the Blue Cross, and to those people on the route who cheered me, even though they didn't know me from Adam. A two mile run this morning, just to make sure everything still works. I didn't wear the heart rate monitor, as I won't tomorrow, so no reading for that. Yesterday I went to ExCel to collect my number. The marathon exhibition was pretty awful: crowded, but I went to the Garmin stand to ask if they had any plans to make the Forerunner work with a Mac. And I picked up leaflets for future marathons: top of the list for the autumn is Monte Carlo, though there are other candidates: Palermo, (sito en construzione, it tells me), Florence, Berlin or Dublin.